She has agreed to gift Twin Flame Service to the world as a mighty light - Samavesha Moksha is magnificent... for she is here to transmute all of it... to bring to BALANCE the WHOLE Picture. In doing so, she does it for all who are evolving in this plane of existence... into the purity and perfection of this Twin Flame HEART-Womb rising to its full power." • Romancing the "Beloved Within" and uncovering the holy mystery with your true "Twin Flame or Twin Ray." Transform the Hero and Heroine’s Journey of your Soul by unveiling the hidden gifts of your most difficult challenges through the courageous translation of your primary Rites of Passage with the benefit of your Royal Heart’s compass and Akashic Life Map. • Initiating Cultural Creatives who hear the calling to reawaken their consciousness into a fully functional multi-dimensional human referred to as “Homo Noetics.” Birth in the strategic leadership of your archetypal “Homo Spiritus ~ Divinicus" - as intuitive love, practical wisdom, graceful power and integrated intelligence. 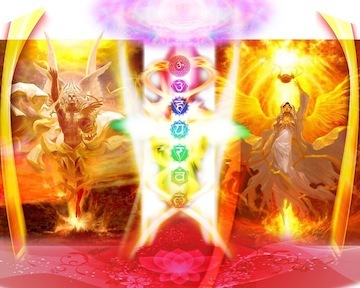 • Reclaiming Your Sovereign Wholeness and Birthright - Coming HOME to your Original Divine Blueprint and manifesting your essential self with the advanced support of Gaia’s - Mother Earth’s - natural vortex of resonant Telluric power. Her central chamber knows your World Soul destiny (all the way down into the very middle or heart-womb of the planet), and She is the raw power source of magic for your dharmic mastery. Contact Us to learn more about our Beloved Destiny Path mentoring, intimate guidance and tantric support for Sacred UNION initiates and School of Mastery adepts. Connect with Samavesha about the training and services available for Dharmic Partnerships, Stewards of the Rose Line Mysteries, Grail King & Queen Lineages, and High Priest/Priestess Savants.